This photo of the 800 block of Metcalf Street in the foreground will help you locate some of the businesses in the stories below. 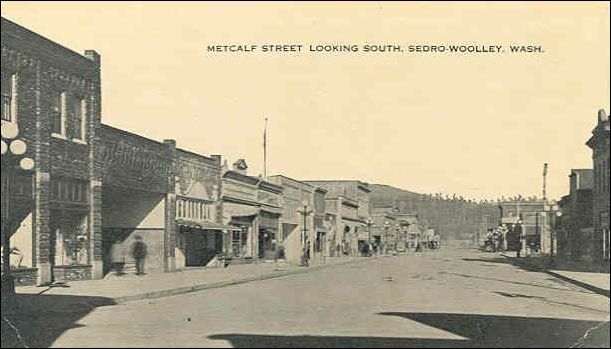 We found this postcard of downtown Sedro-Woolley and were fascinated with it because it shows a rare view of Metcalf Street, looking north (not south! ), sometime in the late Teen years of the 20th century. We know that it was taken sometime before December 1922 because the third building from the left is the Knights of Pythias Building (2006: Paul Kelly's Cascade Fabrics) and that date is when the second story and the half-third story was added to the building. At the far left is the Livermore Apartments, at the northwest corner of State and Metcalf Streets. Next is the Post Office in its old location, built by Skagit Realty sometime before 1912 (2006: Mailboxes business). Next is the KP building, which then housed the Princess Theater. Next is what would become the Piggly Wiggly Grocery in 1923 (2006: Bill's Frame Shop). Next is Curry Furniture (2006: Cascade Mountain Loans). Next is F.A. Hegg Grocery (2006: Hometown Cafe). Next is Jack Ames Barber Shop and Hustead Millinery (2006: Glenn Allen Jeweler). Next is Gampp's Confectionery, then a barber (2006: Holland Drug). There was a narrow alley, which today is a walkthrough with benches. Next was Holland Drugs extension, which would soon house J.C. Penney's (2006: Skagit Surveyors). At the corner of Woodworth is the Bingham-Holland Building, housing Bingham Bank and Holland Drugs. Note the stand of first-growth fir that still stood north of what is Hwy. 20 today. On the far right is the Masonic Building (2006: north half of Greer Drummond's Valley Hardware). Next is Len Livermore's Ford Dealership (2006: Oliver-Hammer Clothes Shop). Next is Lederle's Shoe Shop in a new building (2006: gutted and being totally rebuilt for an engineers firm). Next is--depending on the year, either the Skagit County Courier or theCourier-Times newspaper, which changed owners to Frank and Grace Evans in January 1918. We suspect that this view was about 1918-20 because the next two lots up to the corner of Woodworth street appear to be empty. Tailor Joe Oliver erected the building next to the Courier where two gift shops are located today. 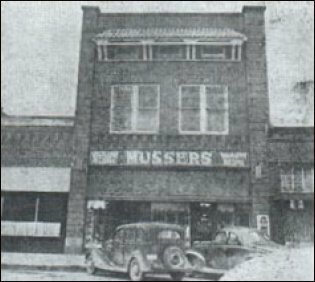 And in October 1923 the Odd Fellows (IOOF) erected their two-story building, which is a video store today, with the hall above long vacant. We continue our Odds and Ends section with small articles culled from issues of various newspapers, especially the Skagit County Times of Sedro-Woolley and the Sedro-Woolley Courier-Times. We were aided in this section by Larry and Josef Kunzler and their loan of clippings to us. And we can now add photo scans quickly, due to the kindness and generosity of Dan and Maureen Royal. Other clippings, stories and photos came from former Sedro-Woolley resident, Pat Hegg Brown, and from our own painstaking research of microfilm and copies of old newspapers. These stories are short and to the point and may be expanded in the future as we do more research. We also hope that readers will share family memories and copies of documents and photos that will supplement the basic stories or explain more about the individuals who are mentioned. We apologize for the condition of some of the photos. Many are from Xeroxed copies of the original newspaper. In future issues, we will add more stories about the Sedro-Woolley area and also feature the upriver district, western Skagit County, LaConner, Mount Vernon, Samish Island north through Whatcom County, and short stories about neighboring counties and all over Washington state. We want to remind you that we very much enjoy copies of stories from any old newspapers, especially those before 1910, including but not only the early Mount Vernon newspapers; the Skagit County Times, Skagit County Courier and Sedro Press of Sedro-Woolley; the Edison Phonograph; the Puget Sound Mail and its "Pioneer editions" of the 1940s-70s, and various early, short-lived newspapers of the upriver boom days.. Many of those papers have burned up in various fires and those stories have not been seen by anyone for decades. George W. White buys The Fair Skagit County Times (Sedro-Woolley), April 5, 1917 George W. White, of Everett, has purchased the five, ten and 25-cent business in this city which has been conducted for some time past by Sam Moulton, the deal having been concluded on Monday of this week, and Mr. White is now in active control. The store has been known as The Fair and will continue to do business under that title. Under Mr. Moulton's management, The Fair has made a fine reputation and this Mr. White promises to do his best to maintain. 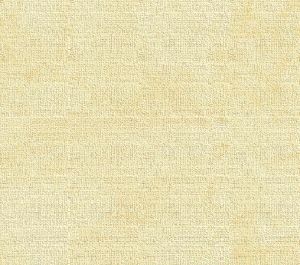 Mr. Moulton has built up a substantial business, and this Mr. White will exert his best ability to perpetuate upon the same basis of fair dealing and prompt service that has governed in the past. Mr. White guarantees the fullest and best possible service to all patrons and extends a hearty invitation to everyone to come in and get acquainted. Mr. White has a family, wife and two children, which will become citizens here as soon as a residence can be found for them to live in. Meanwhile, don't forget to visit The Fair store. Friends of George White, Sedro-Woolley merchant, were shocked to hear of his sudden death at his tome on Warner street early Sunday morning, following a heart attack. Sedro-Woolley stores closed Wednesday afternoon during his funeral, which was held at the Lemley chapel, with interment at Evergreen cemetery in Everett pall bearers were E. P. Jech, Frank Britchford, Everett Blackburn, C.J. Wicker, Q.R. Bingharn and George Bellos. Mrs. G. A. Jones and Mrs. E. P. Jech sang several selections, accompanied by Mrs. W.O. Douglass. Rev. H. L. Ford, of the Christian church, was in charge of the services. George W. White was born Aug. 14, 1881, in Ontario, Canada. He lived at Everett for some time and came to Sedro-Woolley 20 years ago to start White's Variety Store, which he operated until two or three years ago, when he went into the furniture business, and had just completed moving his store to a new location on Metcalf street a week before his death [unknown location — does anyone know where?]. For years he took an active part in all civic affairs in this city. He is survived by his wife, Mrs. Anna White, of this city; by his son, Ben White of this city, and daughter, Mrs. Myrtle Hess of San Francisco. Mrs. Hess was here for the funeral. According to present plans, Mrs. White plans to carry on the furniture store business with the assistance of Ben White, who will also continue to operate his service station at Ferry and Murdock streets. [Update October 2007, Journal Ed. note: Gosh, are we embarrassed. We originally posted an anecdote about George White's wife, Anna, but we have to correct ourselves because of a very interesting letter from Laurie Mills, who recently toured this area on vacation with his wife, Margaret, from Hampton, New Brunswick. Margaret's great aunt and uncle were George W. and Jessie White, who lived in Concrete for many years. Like other historians, we confused that White couple with the White couple we refer to above. As it turns out, there were two different George W. Whites, both lived in Skagit County and both immigrated from Canada at nearly the same time. The George W. White in Sedro-Woolley was married to Anna. We will profile George and Jessie in a separate story in the near future. We thank Laurie and Margaret for setting us straight. M.F. Gampp buys Mount Vernon candy store, 1922 Sedro-Woolley Courier-Times, Nov. 23, 1922 Marion F. Gampp, proprietor of the News Stand and Gampp's cafe of this City, has purchased the Sugar Bowl, one of Mt. Vernon's ice cream parlors. The Sugar Bowl is being run by E.W. Gampp of Seattle, a brother of the local man, who has moved to Mt. Vernon. The former owners of the Sugar Bowl were Mr. and Mrs. Henson. Livermore Garage offers daily concerts Sedro-Woolley Courier-Times, Jan. 18, 1923 Music will still soothe the savage breast, according to the old saying, and Len Livermore is working out thc idea in his garage. A big Edison phonograph has been installed in the office and when irate patrons rush in to demand why their new Stars do not sparkle, they listen to the strains of sweet music. When a new tire is being placed on a car, the phonograph plays "Blest Be the Tire that Binds." The ancient melody, "Get Out and Under," is quite popular with the mechanics. When some young boy drives in with a wrecked car, just as the family was planning to go on a long trip, George Cockreham, out of sympathy, plays "The Old Folks at Home." When some young couple tries spooning in the garage, the phonograph plays, "Take Your Girlie to the Movies, if You Can't Make Love at Home." When a broken spring is to be replaced, the phonograph plays a record from the "Spring Maid." Then when a new car is purchased and the new owner, happy that he need walk no more, drives away, the phonograph plays as a farewell tune, "It Is Well With My Sole." [Journal Ed. note: Len Livermore built the garage for his Ford dealership in 1915. That is the building that houses Oliver-Hammer Clothes Shop today. Sometime in 1921, Livermore lost his Ford franchise and Emil P. Jech moved up here from Bend, Oregon, and was granted the franchise. He conducted the new business in the State Street garage — the eastern half of today's Marketplace grocery location, until November 1924, when he opened the Universal Motor Co. on Murdock street, today's Sedro-Woolley Museum building. Livermore continued selling various models of automobiles in his original garage for an unknown time in the 1920s through at least 1926]. Sedro-Woolley Courier-Times, Sept. 27, 1923 The Stop and Shop store, which is moving from its present location to a larger building on the [northeast] corner of Metcalf and Woodworth streets, will be ready for business in the new place in a short time, probably by the first of the week. One of the changes made by S. L. Brown, the proprietor, is the establishment of a delivery system. The Stop and Shop store, which [bought] a new truck, and will now have two trucks, which will be used for making deliveries to customers. Orders delivered in the city or within a mile of the city, amounting to $3, will be delivered free twice daily. Orders for $10 or more will be delivered free in Lyman, Hamilton, Burlington, Big Lake, Prairie and other nearby towns. Orders from Clear Lake amounting to $5 or more, will be delivered free; and orders of $15 or more will be delivered free in Concrete. The following are the days arranged by the Stop and Shop store for their deliveries out of town: Tuesday, Lyman and Hamilton; Wednesday, Big Lake; Thursday, Burlington and Allen; Friday, Prairie. There will be several novel features in the new Stop and Shop store, and new trucks will added for the delivery service, as needed. New restaurant is started here Sedro-Woolley Courier-Times, Feb. 14, 1924 Mr. and Mrs. L.S. Thorne have opened a new restaurant in the building on Ferry street, just west of Met- calf, occupied for the past few years by Ricker's cleaning shop. Mr. Ricker disposed of the cleaning business. Mr. and Mrs. Thorne have had considerable experience in restaurant work, it is said. They lived at Prairie recently. Journalresearch about the Thornes and Thornwood We think that the building referred to was half of what later became the Four Aces Tavern and now is the Overflow Tavern, but maybe a reader will know for sure. L.S. Thorne may have been the son of Woodbury J. Thorne, who started his namesake village of Thornwood in 1886. His homestead was located north of Cranberry Lake in the Prairie district near the homes of Lyman S. Hall and Amariah Kalloch III, and near today's Hwy. 9. According to the 1906 Illustrated History book, Thorne was born in Lewiston, Maine, on May 6, 1851. At age 18 he was apprenticed as a bricklayer in Maine and he emigrated to San Francisco in 1885 where he continued in that profession and soon opened a fruit and produce store. One of Frank LaRoche Sr.'s most interesting photos is this one that has been published a few times under titles like "the first house in Sedro-Woolley." We recently found it in the University of Washington [UW] Special Collections Archives Division, a resource that seems boundless in its breadth and follows strict procedures to determine the provenance of photos. It is titled "Sedro-First House Built in Sedro, Skaget Co. Wa. 565." We compared the handwritten caption in the lower right corner to known captions by Frank LaRoche and they match. This cabin stands in a dense forest that could have been anywhere from Ball's Camp/Sterling on the west to old Sedro by the river itself. We strongly suspect that this could be the cabin at the old town of Sterling where Minnie von Pressentin and her children slept overnight while traveling upriver in January 1878 to join her husband, Karl (Charles) von Pressentin. 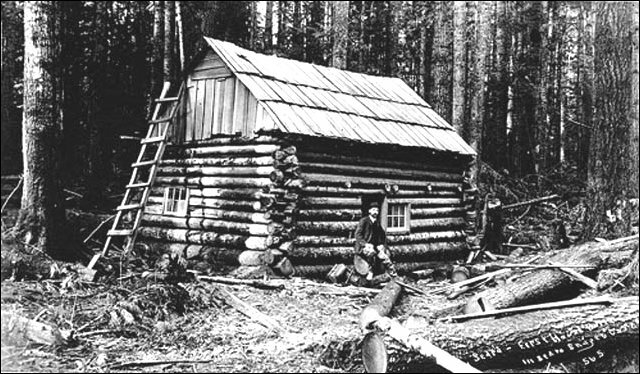 The cabin was built by pioneer Lafayette Stevens, who found the coal seams five miles northeast of Sedro in 1878 that became the Cokedale mines. Paul von Pressentin noted that the Stevens cabin had a sleeping loft upstairs. You will see in the full-sized photo a ladder leading to such a loft. We hope that a reader will know more about the photo. This is what makes studying historical photos such fun. You can also see more LaRoche photos and other early photos of old Sedro by the river at this site. Green Globe confectionery is torn down Sedro-Woolley Courier-Times, March 5, 1929 The old frame building, which has been occupied by the Green Globe confectionery and is now being torn down, is one of the old buildings in the community. It was built in 1899 and was used first as a paint shop by McMurray and Johnson. The lot was first bought in 1898 by Jim Renfro. The place was next used for a plumbing shop and then for many years the Marsh photograph studio occupied the building. From a photograph gallery it became a confectionery, operated for a long time by Hank Wicker, and has been a confectionery and cigar store until the present time. It has one of the most respectable histories of any of the older buildings in the town. [Journal Ed. note: Frank LaRoche was one of the most famous pioneer Northwest photographers, known best for his extensive photographic series of Indians living in or near Sedro-Woolley in the 1890s and for his photos of the growing coastal cities of Washington state. He moved his business from Seattle to Sedro-Woolley permanently sometime by 1910. He leased space from W.B. Pigg, who owned the original woodframe Schneider building on Metcalf street, a woodframe structure that preceded the brick building that the bowling alley most recently occupied. The move mentioned in the 1926 story above was also to a Pigg building in 1926. Frank LaRoche Sr. had retired by then and his son, Frank LaRoche Jr., managed the business. The son moved to Bremerton in 1930 and you can read his obituary at this Journal site. The father died in Sedro-Woolley in 1936 and the son died in Bremerton in 1940. Texas men rent service station Sedro-Woolley Courier-Times, Jan. 5, 1928 Orville and Charles Nicholas of Fort Chaidburne, Texas have taken over the Bingham Park service station and will manage it hereafter. The men are recent arrivals in Sedro-Woolley and will live on the Sumner place in the Garden of Eden district. Ludwick-Wuest new radio dealers Sedro-Woolley Courier-Times, Oct. 11, 1928 Ludwick-Wuest company has been appointed authorized dealer for Stewart-Warner radio sets in Sedro-Woolley. It was because demonstrations of the new set were so impressive that the Ludwick-Wuest concern accepted the agency for Stewart-Warner, especially were they well pleased with demonstrations of the new device invented at the Stewart-Warner factory at Chicago and designed to test the tone quality of a radio receiver. Salesmen at Ludwick-Wuest are convinced that this new device opens up a new era for tone reproduction. This new testing device is really an electrica1 ear. It records the reproduction of music by the radio receiver and speaker, and simultaneously the same music in its original presentation. These two records are then compared and any imperfections in the reproduced music are corrected. Candy stores in Sedro-Woolley Sedro-Woolley Courier-Times, Oct. 11, 1928 All that is needed in everyday diet, can be found in one piece of candy. Candy suited to any taste may be purchased in Sedro-Woolley at any of the following stores: Rex Drug store, Gampps, Britchfords, and Sally Ann Sweet Shop. It is suggested by candy dealers that he proper way to celebrate the sweetest day would be to purchase oneself a gift box of candy. Brossard incubator hatches over 15,000 chicks Sedro-Woolley Courier-Times, March 5, 1929 On the Brossard chicken ranch a mile east [west?] of Sedro-Woolley on the Cook road, are thousands and thousands of baby chicks, hatched the first of the week. The incubator, which is the largest in this part of the county, holds 15,000 eggs at one time and is operated entirely by electricity, and was installed at a cost of several thousand dollars. About 5,000 white leghorn chicks were hatched Sunday, and placed in the brooders. Mr. Brossard disposed of almost 2,000 of the day old chicks which were ordered before the eggs were placed in the incubators. Another 5,000 were hatched the middle of the week, and there will be several thousand a week hatched, as fast as the incubator can operate. The little chicks, looking like butter balls, make a pretty sight as thousands of them are huddled together and many local people have taken their children out to the Brossard farm to see the baby chicks. Mr. Brossard has more than 2,000 grown chickens, and plans to do an extensive business this year in raising chickens on a 1arge scale. Mr. Brossard was recently made a member of t the Sedro-Woolley Rotary club as a poultryman. Changes are made by Piggly Wiggly Sedro-Woolley Courier-Times, March 3, 1932 Oscar: Johnson, local Piggly Wiggly grocery store manager, this week announced the enlargement and remodeling of the local store to meet the increased business demands. The store arrangement has been changed considerably and several feet added to the sales room. Celebrating the change, the store is offering a special food sale event in this issue. Family week at Dream Theater Sedro-Woolley Courier-Times, June 9, 1932 Father and mother and sisters and brothers, all can go to the Dream theater next week, for 50 cents. Manager Dad Abbott is holding family week from June 12 to 18, and the family with a large offspring can see the show for the same price as the couple without children. People are to be trusted not to round up any neighborhood groups to adopt for the evening. Mr. and Mrs. George Green, of Clear Lake, with their eleven children, are offered an opportunity of a lifetime, for cheap entertainment, and there are some others, whose per capita cost of admission won't be much Some fine shows are offered with "Night Court," Sunday and Monday, and "Letty Lynton" now featured at the Fox in Seattle, set for Tuesday, Wednesday and Thursday, and then Nancy Carroll and all-star cast in "Wayward," Friday and Saturday. Many new jobs Sedro-Woolley Courier-Times, April 9, 1936 Frank Shelton has accepted a position with the Bingham Investment company as insurance salesman. Allen Freeman, who recently resigned from the Goodyear & Nelson mill office force to accept a position at the Bingham bank, left the bank the first of the week to work at the Skagit Steel & Iron Works, and Neil Shannon is now at the bank. Miss Beth Sumner is a new member of the Bingham Investment company force. Donnelly buys cheese factory Sedro-Woolley Courier-Times, May 13, 1937 David M. Donnelly, well known Sedro-Woolley businessman, has purchased the interest of Louis Castrilli in the Hamilton Cheese Factory and Creamery company of this city, which has been closed for several weeks due to financial difficulties. He plans to start operating the plant again in the near future, as soon as arrangements can be made with milk shippers. Donnelly has his son, Norman Donnelly, associated with him in the creamery. Louis Castrilli will be employed as plant superintendent in the making of cheese, butter, casein and other dairy products. Negotiations have been carried on for some time with various people in an effort to reopen the plant with Attorneys Ward and Barclay representing Louis Castrilli's interest. For the full list of our collections of Odds and Edds short newspaper features about Sedro-Woolley, see our introduction to the Odds and Ends section, short stories from several areas, including five collections of short stories from various newspapers throughout the years about Sedro-Woolley businesses and pioneers. See our extensive Sedro-Woolley section. We want to especially thank Larry and Josef Kunzler, who have provided copies of dozens of newspapers that we are researching, scanning and transcribing. And Pat Hegg Brown, a granddaughter of Sauk and Sedro pioneer F.A. Hegg, who looked through her collection and found dozens of clippings that we are studying. These copies of old newspapers and clippings are a very valuable source that we appreciate very much. Do you or your family have clippings that you can share and mail to us?